Happy New Year!! I can’t believe 2019 is already well underway – my 35th year around the sun is off at a fast pace with major hopes, dreams and plans in the pipeline, including TRAVEL. The bug hit me hard again this holiday with my first trip back to Idaho to see my mom’s side of the family in 10 years, and the very first visit to my grandma’s ‘new’ home in Ontario, Oregon. I put ‘new’ in quotations because she’s lived there for four years now and, yes, I feel guilty it’s taken this long … But I’m so happy I went. There’s something extremely calming about a reunion with my country roots, even if it means bundling up and being entirely unprepared for 26-degree weather. Because it also means long walks and talks with my mom and grandma, staying up late to watch Christmas movies, waking up early to huddle around her counter top sipping coffee in our robes. It’s a chance to slowww down, unwind and live in the moment. As much as I can get caught up in the city life, the competitive chaos and excitement, the ‘work hard, play hard, no time for sleep’ mentality, deep down I’m a small-town girl with a thirst for the outdoors and adorable coffee shops where the barista knows your name. Thankfully, my parents share the same spirit so we couldn’t leave Boise without some quality time in the city. First stop on our list: Dawson Taylor Coffee Roasters. Their origin story starts in 1995 as a response to Boise’s need for a local roaster of ‘exceptional quality coffees.’ And I can vouch for the exceptional. My almond milk cappuccino was better than delicious; left me wishing it was twice as tall. Buzzing with a mix of youthful suits and college students, the café’s friendly staff and carefully curated pieces from local artists adorning the walls gave off familiar Portland vibes. My mom even discovered a bin filled with burlap sacks for $1 and couldn’t resist buying a couple for her DIY projects. Meanwhile, I have always had a thing for stickers. Don’t make me begin to explain why. I’ve never used them – merely collected, kept and admired. Someday I’ll unpack the many boxes hat boxes filled with them but for now I added this one to my budding collection. According to the website, Dawson Taylor uses European-style drum roasters and a hands-on method to bring out the best flavors in its daily roasts. It’s also an environmentally conscious company, mindful of the social impact and need for delicate sourcing from coffee-growing regions. HELLO, it’s about more than plastic straws! I’m more than happy to support their artisan coffee experience. We finished our coffees, along with fresh pumpkin and banana bread, and made our way down the street to Freak Alley – a recommendation by my cousin Carlee, tucked away in the middle of downtown Boise. 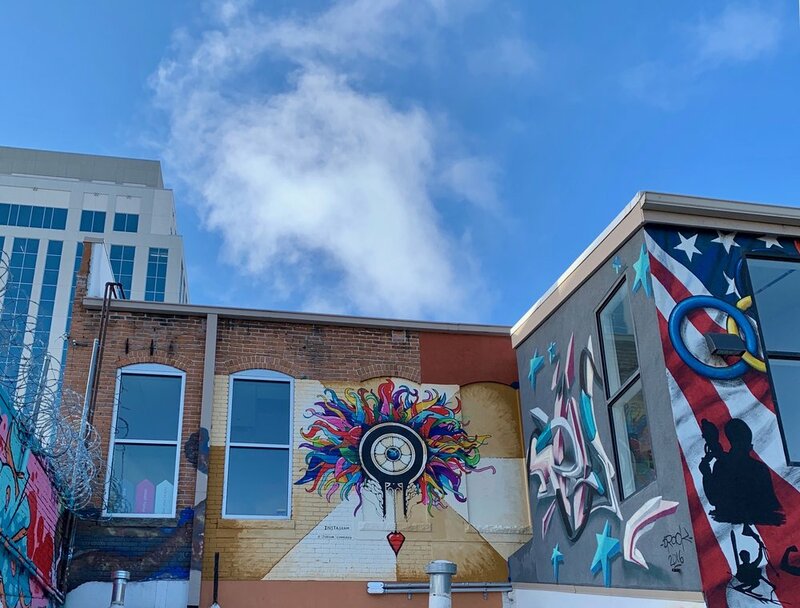 Established in 2002, Freak Alley has become known for its murals, graffiti and public art; said to be the largest outdoor gallery in the Northwest it relies solely on donation and volunteer work to operate. 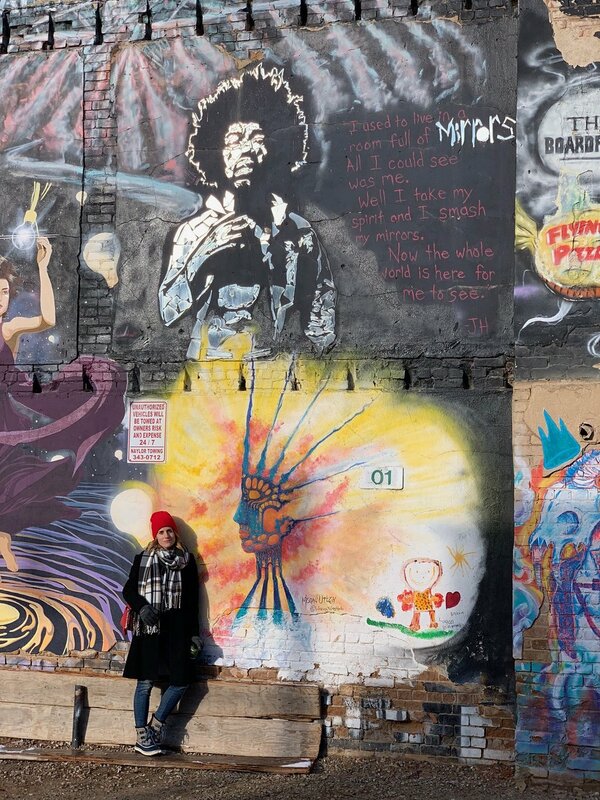 What began with a painting of a single alley doorway now extends from the alley to a gravel parking lot, with new murals added or incorporated into the old ones every few years. What I love most about Freak Alley is that it accepts anyone interested in becoming a part of this culture. There are pieces inspired by music, movies, heartbreak, hope. The spirit of inclusion is unmissable with art from creative minds as young as 6 years old. I could get lost in the cracks and doorways reading words that someone may have never felt comfortable saying out loud but found a voice here in these walls. Or experience the texture and beauty of a piece that was built into brick from contrasting raw materials like glass and metal. I stood in the middle of the gravel parking lot feeling full of wonder. So much curiosity about these artists, where they came from, who they loved or lost. I’ve always had a fascination with street art, its ability to transform something utilitarian into a story board. To create a common thread across cities, countries, and give a new canvas to creators who don’t have access to or aren’t accepted by ‘traditional norms’ of the art world. Digital mediums are great too but seeing this kind of work out in the open air makes it come alive. We took some photos to remember and, after losing feeling in my hands (again, 20-something degrees out here ppl) we walked a few blocks to check out the Boise State Capitol, stunning as ever dusted in snow and sunlight. Followed by a quick car ride down to Julia Sterns Park along the Boise River, making a trail of footprints until we found ourselves surrounded by a beautiful mountain range. The air is unbelievably crisp and clear here. Honestly, what is this life?! Spending time in Boise was my perfect little gateway drug to close out 2018. I’m coming into this new year with vim, vigor, an intention to GET CURIOUS AND KEEP EXPLORING >> myself, others, the world, the universe. Anything that lights up my soul will be getting a ‘hell yes’ and anything that doesn’t, you get the picture. So, let’s do this. Here’s to more adventures outside the city, more creating my own works of art and more quality time with people who want to be part of this path. And if there are any hot travel destinations on your list, please drop a comment and share those tips! This past week and, well, the past few months left me thinking more than usual about gratitude – about how and where it shows up in my life, habits or behaviors I may be holding onto that take away from it and what practices I could adopt to live and love from a place of abundance. Without turning this into a pity party, I can honestly say this year has had its share of ups and downs. I’m frustrated with lot of what’s happening in our country politically and economically. I’m facing a few personal demons and recognizing my responsibility in creating (or not creating) my own happiness. At the same time, I’m experiencing so many wins. And you know what? I’m learning to find gratitude in all of it. No, every day isn’t always an improvement but to the best of my ability I’m no longer hiding from the negatives. I’m listening to the lessons, using them to guide me and moving forward instead of looking back. FAMILY who supports everything I do and loves me unconditionally but also keeps me in line. I love that as I get older our conversations and closeness grow deeper. I can be open about almost anything with them and know that even if we disagree, we appreciate our differences and intend to create a safe space for expression. FRIENDS who know how to make life’s little moments a little sweeter, who will dance in the streets if the mood strikes, who aren’t afraid to say I love you and pick me up off the floor when my pain is too much to bear. They call me out on my BS, encourage me to pursue passions and remind me that I am imperfectly perfect on the days I don’t see it. YOGA for challenging me physically, mentally, emotionally. I’m still terrified to do a handstand on my own but I know one day it will become second nature. For a studio that embraced my ambition this year to make moves, find community and work through my troubles on the mat. KITTEN for shining a light on the importance of patience and filling my home with consistent affection. On my worst days, he’s there to greet me at the door and won’t leave my side until I’m smiling again. And on my best, he lets me smother him with all my goofiness. Call me a sappy cat lady but making the decision to bring him home was both selfless and selfish. LONELINESS for teaching me that you really can provide everything you need. I love my ‘me time.’ Some of my closest will debate with me on this but I am an introvert. I need space to feel whole. I also understand that proving my independence (to myself and others) is not necessary, and that I can ask for help. I think for a long time I believed that If I didn’t have to lean too hard on anyone, I would never get hurt. Of course, that also meant I would miss out on the joy of being truly seen. So, I’m taking this opportunity, this gift of loneliness as a challenge to face my fear of getting too close and I’m excited about what’s on the other side. GROWTH for pushing me to discover my own limits, or lack thereof? And to truly realize my power. I still have a lot of work to do, but I can now say I’m excited about that. I’ve always loved learning and for once instead of learning about something outside of me, I’m turning inward to celebrate my strengths and forgive past versions of me as I shed them. Growth has brought me hard times, new friends, non-friends, more awareness and enlightenment than I could have imagined. What are you thankful for right now? It doesn’t have to be grand or life-changing, positive or negative. It really can be anything that makes you feel. If you’re looking for more gratitude in your life, my friend and fellow Wanderlust Ambassador Asal Dean is on a mission to spread kindness at scale with her Gratitudegrams™️ project. She understands the value of showing yourself and others gratitude and is creating the tools for all of us to make an impact. Just think if we each shared something we’re thankful for every day, it might help make the difficult moments a little easier to bear. I’m hoping to interview her soon – stay tuned! In case you missed it, in July I joined the brand ambassador program for Wanderlust Hollywood - a gorgeous studio located in the heart of Hollywood on a mission that extends far beyond movement on the mat. Wanderlust is creating a community rooted in mindful living and a safe space for you to explore your unique path to a deeper yoga practice, self-growth and enlightenment - to “find your true north.” I also happen to love all things travel so Wanderlust by every definition speaks to my soul. As I sat down to write this post, I found myself reminiscing on the first class I took here. I don’t recall the teacher but I ventured outside my comfort zone that morning with the help of my friend Sandy for an unexpected surprise. I’m telling you the energy and peace I felt when I walked into this place is unprecedented. And I’ve tried quite a few different yoga studios and styles in this lifetime. But the teachers… The humans are the gravitational pull that would eventually point me back here with a bigger purpose. The ones I choose to lead me on this journey radiate with positivity, soul and intention every time they step into the room. They work so hard at what they do and it’s evident in the messages they bring forth to carry beyond the class and into our every day. They align with my own personal values of curiosity, kindness and integrity. Put it this way — next to practicing in Ubud, Bali, looking out into the jungle with birds chirping in my ear, this is as good as it gets. Have I convinced you to check it out for yourself? Read on for a deeper dive with the Wanderlust team in NY and LA, plus some fave photos of the studio. I’m incredibly thankful to them for the insightful Q&A and hope you find something here that inspires you to drop by and see us. What are three words that embody the spirit of Wanderlust Hollywood? What does it mean to"'Find your true north"? How would you describe the Wanderlust festival experience to someone who's never been? What is your inspiration for new dishes added to the cafe menu? What are five Wanderlust goodies you can't live without? How is Wanderlust Hollywood growing its presence in the Los Angeles/Hollywood community? What are some key attributes of a Wanderlust yoga instructor? How do you come up with the focus of your Workshops? Let me preface this post with a friendly reminder that I am very much in an information-gathering phase of my "spiritual enlightenment." I'm reading books, attending classes, podcasting the heck out of Oprah's Super Soul Sundays and generally enjoying new different discoveries and viewpoints I'm encountering along the way. I've never considered myself to be a religious person so these are some of the ways I find peace. Until about a month ago, Sound Baths were just about as foreign to me as a cool day in California (ba dum tsss). I was intrigued and wanted to check it out, and yet I also perceived them to be a little too hippie dippy, woo woo, for my liking. I was afraid of what I didn't know or understand, so I avoided... until I didn't. I'll do my best to keep this part brief but my first sound bath experience began with meeting a friend for drinks at happy hour beforehand. BIG mistake. You can imagine, walking into a large room with vaulted ceilings and proceeding to try and lie down, relax, empty your mind after throwing back a cocktail. The lovely instructor told us how each her three gongs represent the energies and cosmic vibrations of Mercury, Earth and Pluto. And as a closet science geek, I was HOOKED on every word. But I couldn't calm down. My heart raced, my anxiety triggered and my mind wandered away from the beautiful space she created for us as I shamed myself for having that drink even though I enjoyed it in the moment. An hour later, I found gratitude for all of it on the drive home. Thankful I went for drinks with a new friend because I really value our time together; thankful I attempted my first sound bath because now I can prepare better for the next one; thankful that I got a healthy dose of astrology and reminder that I love learning about our connection to the universe. You better believe I fired up the Netflix docs on space exploration and revisited the difference between cumulus and stratus clouds. Exciting stuff! Then, a couple weeks later, I got the invite from my Wanderlust ambassador lead to help host a rooftop Sound Bath at Neuehouse in Hollywood. This was my chance to do the thing right. And not only would I participate, I'd get to set up the space, meet tons of new people and see first-hand how Wanderlust engages other like-minded brands in the area to put on community outreach events. Sweeet. Sign. me. up. Arriving at Neuehouse is a treat on its own. The place is stunning, with meticulous interior design and attractive LA professionals who pay top dollar to co-work in a space that has all the fixings. The cherry on top is two large rooftop areas, one for hosting outdoor movies and the other for a number of other activities including our sound bath special. Another gorgeous day in LA, the sun was still high in the sky at 5pm and perfectly displayed the cozy ambiance we created for a packed house. The combination of yoga mats, pillows, blankets and faux sheepskin throws, plus gifts from Wanderlust Hollywood and Linne Botanicals - I've never met an adult nap this chic. Victoria Keen was our spiritual guide for the evening, and she is awesome. One of those humans who immediately puts you at ease with her smile and makes you feel like you can ask anything. Her energy is contagious and before I knew it I was picking her brain about crystals, the benefits, ways I could recharge them for different uses, Mercury Retrograde, the new moon. I could have talked with her for hours but the show must go on. I'm lying there, wrapped in a blanket, outside (my favorite place to be ever), eyes shut, taking in the incredible sound sorcery of gongs, chimes and other instruments Victoria shared with us. So much creativity and vibrational movement. Why could I not relax?! Once again, I was caught up in my random thoughts and to-do lists, taking me away from the present moment. Unable to sit still and sink into the gift of being surrounded by 100 sleeping beauties under the sunshine. I remembered how I was told sound baths can conjure up deep feelings, physically and emotionally, and it's good to take some time after to decompress but I never expected to feel so much at once. In that moment, I was tense, frustrated and discouraged, like the art of meditation and 'being present' may in fact be impossible for little old me. One one hand, my rational brain knows this is not true. Like anything, it's a practice, and I forget that at times where I want to be the very best and nail something on the first try. And on the other hand, am I going to need a therapy session after every meditation? Or is this kind of intensity a spiritual breakthrough? DISCLAIMER: If you know me, you know I'm EXTRA hard on myself. It's something I'm aware of and doing what I can to consciously keep at bay. But it's also part of who I am and I want to embrace it. Just FYI as you read my posts. Breakthrough or not, I left with a stronger connection to myself. I love putting on events that bring communities together around a shared passion - it's part of my day job and something I crave. I also had an amazing time bonding with my Wanderlust team and meeting Victoria, whom I will continue to follow and grow with. Find out more more about her journey here. What are your thoughts, fears or perceptions of sound baths? Are their other mindfulness methods that work for you? 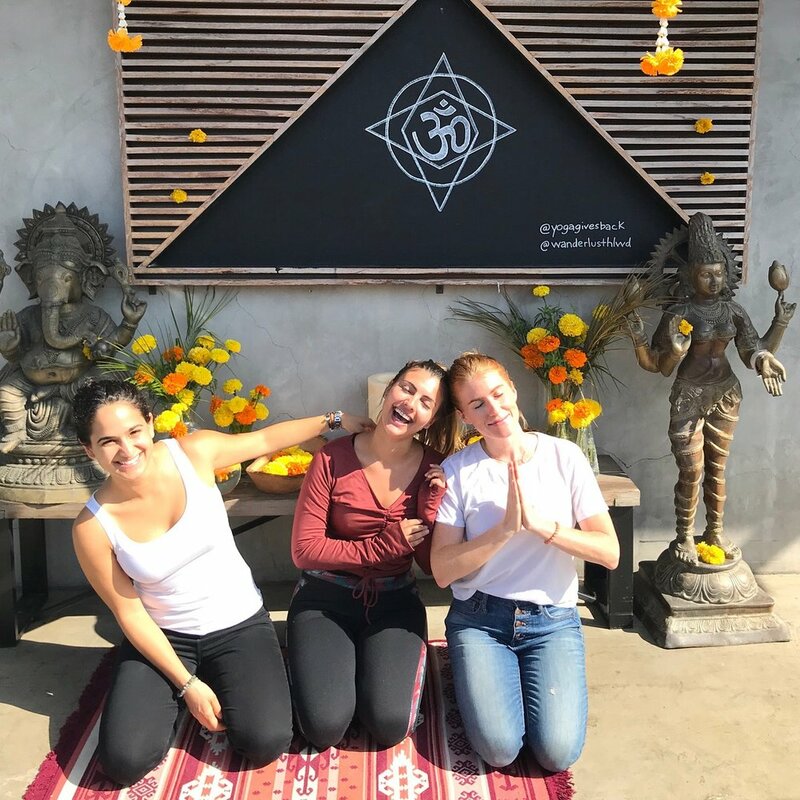 Wanderlust Hollywood has a huge variety of classes and workshops, spanning yoga, meditation, sound baths, and more - something for everyone. The motivation for this post comes from a podcast I listened to recently (Bad on Paper, episode 11 to be exact) where the hosts quoted a statistic claiming people spend an average of 4 hours on 'self care' per day - NOT including sleep. At first, this seemed like an overestimate... until I reflected on how many different activities fall into the realm of "self-care." Especially with all of the new age thinking going around. The practice of taking action to preserve or improve one's own health. Well, shoot - in that case, dedicating 4 hours to the improvement of our health is awesome! But it also got me thinking, not all of the things we do to take care of ourselves are creating a sense of peace and calm. For me, mornings always used to be a rush. Every day I felt like I woke up behind -- to an inbox filled with emails, texts awaiting response, a list of things I forgot to do. I barely got out of bed and someone else needed something. It's only in the past year or so that I started truly prioritizing WHAT I NEED. And I found the best way to do this is at the start of my day. You won't see meditation on this list because I still haven't mastered the art of sitting still long enough for that. But hey, baby steps. Most of my rituals don't take much time at all, yet they're a great way to give myself some extra attention every morning and hit the reset button before racing to work. I don't know what a peptide is and I fully intend to learn. All I know is that a little collagen every day keeps the aging away (in my experience). Whether you're with me on matcha, or a proud coffee fiend, the ritual is essentially the same. The smell and sweetness of sipping on something delicious that I know is also good for my body and mind is intoxicating. Learn more about the harvesting and amazing benefits of matcha here. Some days it's a walk to the nearest park or hiking up to Griffith Observatory, matcha in hand. Others it's firing up my core with a little HIIT or getting my down dog on. In fact, switching it up makes this ritual all the more fun! Pick something that makes you excited to get out of bed and sweat. If you're dreading your workouts, you're doing it all wrong. There are so many options out there - the key is trying them to see what sticks. Quick plug: If you live near Hollywood and haven't been to Wanderlust, I can promise it's worth a visit. They have a variety of classes to get you moving, meditating, pushing your body to new limits and finding flexibility you never knew you had. I can't get my headstand quite right and their instructors are committed to helping me get there. We're conquering fears over here, my friends! I'm currently moving through Danielle LaPorte's White Hot Truth at a snail's pace, but I love that I can read a chapter, even a few pages, from it each morning to set the tone for a lighter and brighter day. If I'm really feeling one of her teachings, I'll grab my journal and use it as a prompt - jotting down whatever comes to mind. It's a free-flowing exercise to to clear my head of any negative thoughts or remember what I'm thankful for. Gratitude is gold. One of the biggest culprits for causing me stress in the morning is the damn phone. Put that sh*t down! This goes for evening too. At least 30 minutes before I got to bed and 30 minutes after I wake up is a phone-free zone. The last thing I need to start my day and cloud my head is mindless scrolling or unintentional comparisons. Also worth noting, when I do this, I find myself staying off of social media or other distractions more throughout the day which means I get more done and I feel better about productivity. Every minute is a gift and I'm here to use them wisely. These are just some of the rituals that work for me personally. They won't work for everyone, and that's the beauty of our individuality. Just as we all have different stressors or triggers, we all have unique ways of healing - pressing pause, quieting the chaos and getting grounded. How do you start your morning? Are there any habits you've picked up that you didn't even realize help ease stress or bring you relaxation until you aren't able to make time for them? Just 1.5 hours north of Los Angeles, there lies a quiet, quaint town filled with delicious food, relaxation, rolling hills and rich history. If you're looking for a weekend getaway from the traffic, smog and general city chaos, Ojai is your beautiful escape. And although I took nearly seven years to get here, trust me it was worth the wait. As a first-timer taking my mom (one of the most worldly travelers and gracious hosts I know), I researched and gathered recommendations from every friend who'd ever mentioned going. If you're an avid Ojai-goer and I didn't hit you up, please drop any recommends in the comments because I WILL BE BACK. Before I get into all of the wonderful things about our trip, let me just say that the Thomas fire last year really took a toll on the natural habitat across Ventura County. Many Ojai residents were thrown into a state of fear and vulnerability, having to leave their homes behind not knowing if/when they would return. In fact, it's a miracle that this 4-square-mile town of 8,000 people evaded for the most part California's largest fire on record. You can feel the impact in conversations with the locals -- discussing the evacuations, reminiscing about origins and folklore of the region. But strength and resilience are also fiercely present. Ojai is getting its groove back and I can't wait to see what this community comes up with next. Thanks to a friend's endorsement, we stayed at the most charming hipster hotel I have ever laid eyes on. Owned and operated by the Shelter Social Club, Ojai Rancho Inn maintains its 1950s roadside motel aesthetic on the main highway heading through Ojai. With its intentionally understated exterior, we almost drove right past it as we entered town. In addition to its tastefully chic rooms, each with a front porch and cozy matching chairs, the Inn puts on a post-sunset party at its adorable indoor/outdoor bar, Chief's Peak. Grab a seat, listen to classic vinyl records and chat with a mix of regulars and weekend warriors who discovered Chief's by word of mouth. The hospitality here is unmatched, and the drinks follow suit - a mix of craft brews and homemade shrubs. It's poolside vibe with indoor/outdoor seating gives you all the options and zero hassle. Open from 4-10pm, it even calms down in time for any Rancho Inn guests having a low key night. Overall, Ojai is not where you go to get rowdy and stay out 'til 2pm. Everything about this town screams relaxation and I'm here for it. HOSPITALITY - We were greeted with so much love and attention, gifted matches and Palo Santo as aromatherapy and clearing of negative energy. TRAILS/WALKABILITY - We rarely drove all weekend. Just a few steps from the porch puts you onto walking/bike paths that take you into town and beyond for up to 15+ miles, the perfect exercise before diving into a coffee and pastry or a giant bowl of delicious pasta. 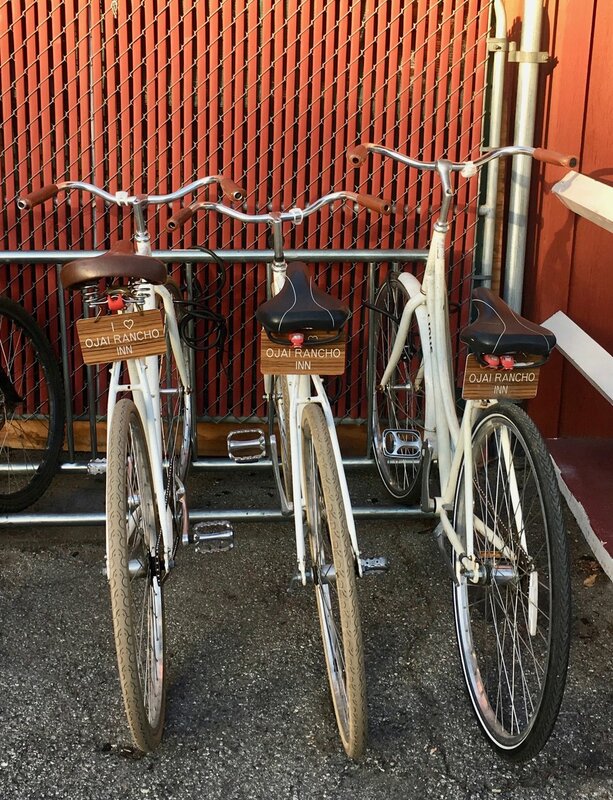 The hotel also offers free bikes if you're wanting to get around faster. POOL AREA - Surrounded by available (key word) lounge chairs, hammocks, corn hole and fire pit, this is very clearly an oasis for hotel guests only until late afternoon when the drinks start flowing. It's an ideal spot to grab a book, take a dip or a nap. Whatever floats your float? PET FRIENDLY - We brought my little Ollie bear and he loved lounging on the bed near the window, or on the cool floors of our hotel room. Plenty of space for his supplies and crazy convenient for me to not get a sitter. Topa Mountain Winery, (Vineyard, $$) - This beautiful vineyard is located next door to the Ojai Rancho Inn and boasts a lineup of hand-crafted wines from the Ojai Valley. We made fast friends with the bartender who gave us her history in Ojai and pointed out the hills of Chief Peak. Then walked the grounds, smelling roses and shaking hands with the owner as we took home our favorite bottles. A great start to the trip. The Nest (American restaurant, $$) - Packed full of fresh ingredients, this is one of the more health-conscious menus in town. I ordered the Ahi Bowl. If you know me, you know I can't resist most foods in bowl form. And my mom ordered the Calamari Tacos. We sat outside to catch the last few hours of sunlight and washed them down with the Ojai Pixie Ale. I should also point out this was very reasonably priced. Great for a casual lunch or dinner and gives you the energy needed to keep exploring. Knead Baking Company (Cafe, $) - Two words for you: Almond Croissant. We were told it was life-changing but I don't think anything prepared me for that first bite of rich (and dare I say moist) almond flavoring in the center of an impeccably flaky and buttery croissant. To add a little savory, we also ordered the quiche which came with a side salad. Some solid greenery always makes me feel slightly less guilty about the sugar intake. Farmer and the Cook (Mexican restaurant, $$) - The only spot we drove to came highly recommended by a good friend of mine. This isn't your traditional Mexican joint. For the most part, everything here is vegetarian and many dishes can be made vegan. Our colorful sopitas (3) came topped with beans, cheese, pico de gallo and avocado, served alongside Spanish brown rice and fermented latin cabbage salad. What's not to like?! Splitting the last one was TOUGH. I also got a beet juice but I won't rave about that because, well, it's beet juice. Tipple and Ramble (Wine bar, $$) - Instagram heaven and a massive dose of inspiration for my work in marketing and events. I took a million videos here as we walked through a garden of summery umbrella tables and a pint-sized, branded AirStream RV with colors to match. Somehow I'm coming up short on photos but I borrowed one from @tippleandramble below. Consider this a teaser because you're going to want to look it up. Although we passed on wine this time, I feel good about having another go-to spot for the next visit. Ecotopia (Experience, $) - A 9 mile drive from the Inn led us up into the hills of Ojai Valley where we discovered a dirt road, signs of a construction and very little direction on how we should spend our two hours at Ecotopia for $20. By definition, it's a Community Supported Agriculture (CSA) program that "plays a vital role in establishing secure and vibrant sources of food, while also providing dazzling arrays of offerings that respect local traditions and ecology." Not sure what that means you can expect on a tour? Me neither. On arrival, we quickly discovered a small path that led to a handful of 'hot pools' filled with black sand... possibly some ash from the fires and floods. Definitely not your typical springs. But my mom is such a trooper and we fully embraced no clothing required to sink ourselves in the black sand for some natural exfoliation. Would I do it again? Probably not, but we laughed, soaked up the sun, and took in the nature around us before calling it a day. In the end, I feel good about helping to fund a rebuilding of this site, which pre-fires was supposedly a lush oasis and recommended destination for visitors to the area. Farmer's Market (Food/Shopping, FREE) - We happened to be in town on a Sunday and stumbled on this one after grabbing breakfast, such a treat! Took home some hand-crafted soaps, and mediterranean dips, flatbread and olives for sunset picnic later that night. April is also home to the Ojai Pixie Festival, meaning everywhere you go there are fresh, juicy tangerines (think cuties but even more delicious). Bart's Books (Bookstore, FREE) - Never met an outdoor bookstore I didn't like! More like, I've never met an outdoor bookstore period. And this one stole my heart. The largest independently owned bookstore in the US, Bart's Books came to be in the 1960s when Richard Bartinsdale's book collection became so overwhelming that he constructed a series of book cases along the sidewalk for passersby to browse titles. Everything is for sale via the honor system (the beauty of someone sharing their passion with the world) and what remains of the original home is bursting with personality. Even the cookbooks/recipe section is perfectly placed in the kitchen, SWOON. Rows on rows on rows of books, you just have to trust me and check it out. If I could move in I would. More pool time - As an Angeleno without a pool in my apartment complex, this is KEY. The weather was amazing and we found a few minutes to pause and read in our chairs but I would suggest carving out an entire afternoon. Especially if you stay where we did! 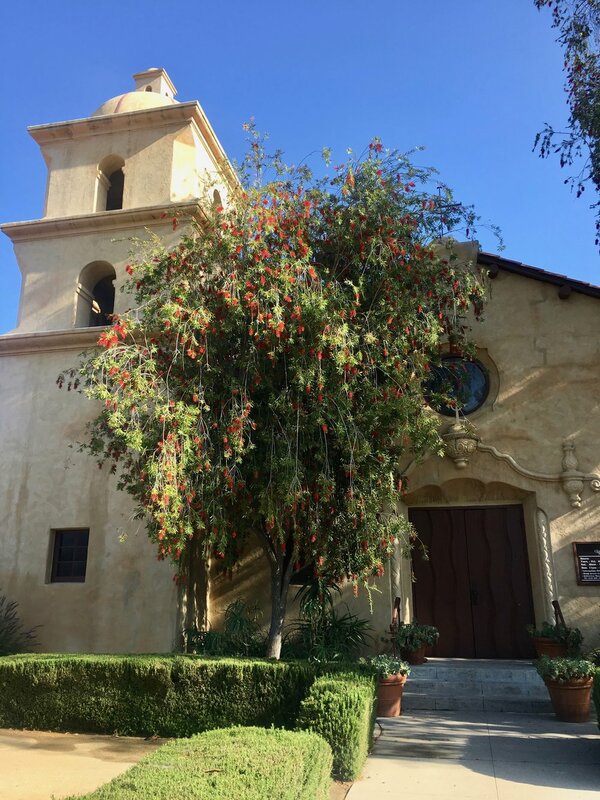 Book a spa treatment - Ojai is known for its spa culture and, while we ran out of time this trip, it's high on our list for take two. Something about doing this outside of the city and your regular day to day routine makes it feel even more indulgent and so important. A different point of view - Unfortunately, Mediation Mount is still closed in the wake of the fires but it's supposed to have incredible sunset views of the entire town. For a first visit, walking all over town and stumbling on new finds was equally enjoyable but hopefully the Mount will be up and running again in the future. Bottom line: Ojai holds a special place in my heart. This was a staycation success and I wouldn't do a thing differently. If you want to know more about where we stayed or any of these activities, OR if you have any recommendations of your own, please drop me a comment. Always love to hear from you. First full day at the beach, sipping on mojitos after bumpy but joyful bike ride. This April marked three years since I traded my adventures in New Zealand and Southeast Asia for a return to Los Angeles - THREE years! Each one flying by faster than the last, all filled with memories and milestones that have brought me to where I am today. When I realized this much time had passed by without taking a trip that was all mine - not a family trip, not an office holiday - I made it a priority to book one. Tulum was on my radar for a couple of years, after seeing posts from family, friends, my most beloved travel influencers, and I wanted to get there before it goes full Cancun or Playa del Carmen status. Despite the evident construction and high-end establishments moving in, there's still a quiet, comfortable charm that makes you want to stay "just one more day." Lucky for me, I have a wonderful friend with the same thirst for adventure. And because we had such an amazing time, I want to share a few of our favorite finds with you! The Universe handed us a big 'ol blessing with the AirBnb we booked for this trip. Our full-time concierge, Jose, is one of the most lovely human beings ever to exist. He's full of jokes which made us immediately feel at home and thought of literally everything we could need as guests; including recommendations on the best local restaurants and money exchanges, as well as immediate service and guaranteed good rates from his friendly taxi drivers. He even cracked open our first Coronas in Tulum the night we arrived and took us to the local supermarket to stock up on essentials. I will always cherish his generous hospitality and would be lucky to cross paths with him again someday. Personally, I don't see the need to spend upwards of $500-600 per night to be right on the beach, where you never escape the sand. If you're interested in booking this spot or something similar, you can check it out here. Bug spray (with DEET) - This is a mandatory. I repeat. Do not leave home without it. I brought some baby-safe version of bug spray given all the health warnings about deet, but ended up using my friend's more aggressive version from REI to survive the madness. We still ended up with bites on nearly every part of our body, but can you imagine what we'd have done without this stuff?! I shudder. Straw Hat - I pretty much never took this off while the sun was out. Having fair skin and living in Southern California means religious sunscreen application, but it also means straight up keeping my face out of direct sunlight. Good skincare is always on-trend and it just so happens these hats look cute with everything so it's a win-win. Fun, flirty dresses or jumpsuits - Overall, the vibe in Tulum is very casual. But I love an excuse to dress up, especially on a getaway. It will depend on your itinerary, but our Friday/Saturday AND Sunday nights were the perfect opportunity to play a bit more with the fashion. Simple sandals - Footwear is the least of your worries here. To be safe, we packed a pair of hiking sneakers, flip flops, strappy day sandals and one pair of block heels for when you're feeling dangerous. I'll state the obvious: heels are not necessary at the beach; but unless I'm purely on a backpacking trek I just really don't feel complete without them. View atop the Coba Ruins - tallest temple on the Yucatan Peninsula. The magical Cenote Multum Ha, just a short drive from the Coba Ruins it's the perfect cool down after climbing all those stairs. Coba Ruins - Transportation was the biggest hurdle for this one. Once you're there, the entrance fee is really inexpensive (55 pesos, or roughly $3 USD). I would have paid a LOT more for this legendary view. At the highest peak, it's as if the trees never end, blending into the sky and beyond. For those few moments, you're reminded just how small we are and any ounce of stress or worry fades away. Cenotes - Just a few miles from the Coba Ruins, our driver led us to the beautiful underground Cenote Multum-Ha. I can't even do it justice with a description, you have to go and see these wonders. After rinsing off with some fresh water to rid our body of any sunscreen or other chemicals, we descended into the cenote via a short spiral staircase. You could feel the air get a bit mustier as the light above disappeared and found ourselves fully enclosed in a cavern, surrounded by bright turquoise water with the glassiest reflection (see photos below and watch in wonder). With no one else around, we took a few jumps before simply sitting and indulging in the madness. The fact that we could see all the way to the bottom, could hear only the tiniest trickles as the water barely moved and were joined by just a few algae eaters. With plenty of cenotes in the area to choose from, It's a level of peace and stillness everyone should experience. Casa Malca - This was by far our most luxurious stop. Everywhere you turn has a remarkable aesthetic and a new piece of art, including work from Kaws, Jean-Michel Basquiat and Keith Haring, along with noteworthy pieces from Pablo's personal collection. Can you believe they had a chaise lounge from the Titanic perched atop the foyer? Get your cameras ready! Also, fun fact: Long before the resort was purchased by a New York art collector and flipped into a trendy resort for tourists, it was the reputed hideout of the Pablo until he died in 1993. With just nine rooms total, you're paying a pretty penny to stay here so my recommendation is - put on a cute outfit, snap some photos at the insanely gorgeous entrance, take a walking tour of the carefully curated designs and grab a drink at the bar. Step into the shoes of a Colombian king for the day. Salsa Dancing - If you're into shaking it on the dance floor or watching some of the best salsa dancers in Tulum, we switched things up one night with a trip to La Zebra. Winds were high so it was a little chillier than expected and the drinks were just alright, but we had a blast dancing with the locals and people watching from a swing on the beach. If you're looking for more of a club atmosphere, we spent another night dancing on the beach to electronic beats spun by a DJ at Papaya Playa Project. This was definitely more of a party, younger crowd, with entry fee and drink tickets, but there's something special about making new friends under the moonlight on the beach. Goofing around in these hanging chairs at the grand entrance to Casa Malca. In my best Chandler voice, "Could there BE a more gorgeous entrance to an eco-friendly resort?" Literal heaven, this was one of our first food stops after day one of sunning at the beach. Between the two of us, we tried the Shroom Brew, Maki Roll and Chia Pudding. All were fresh and delicious AF. The nice part about this spot is they have a great variety on the menu, plenty of more filling items when hanger sets in or the lighter fare we went for if you're in the mood for a snack between meals. Also, worth noting it's packed with shiny, happy people (I immediately wanted to know all their beauty secrets) and the cutest little hammocks and handmade stools to cozy up. If there weren't so many amazing places to try in Tulum, I'm confident this would have been an every day occurrence. Arca (fine dining, $$$)- During the 5 night stay, we treated ourselves to a few upscale dinners because why not? We're worth it. 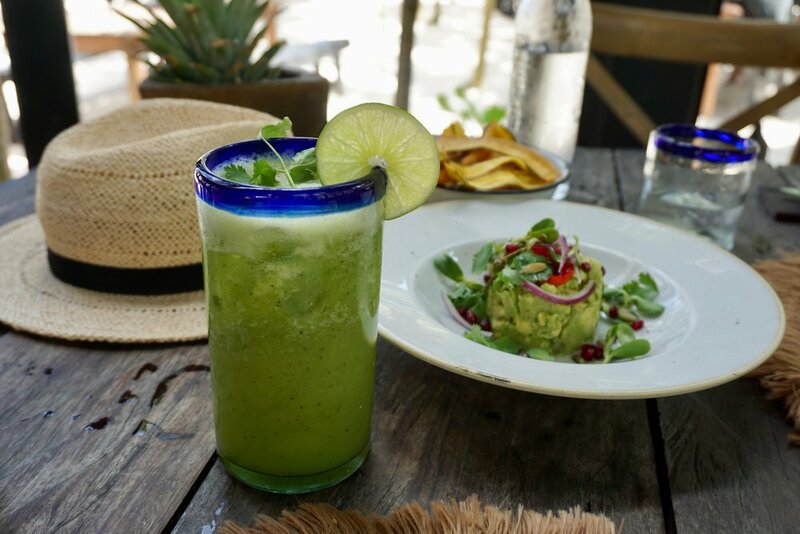 Also, because Tulum's gastronomical scene is in its prime, with several booming restaurants paying homage to the region's fresh ingredients from farm and sea. Arca was an instant favorite. The menu is seasonal based but if you can ORDER THE ROASTED PEPPER TARTARE. I cannot even describe to you the flavors of this dish. Topped with a cured egg yolk, roasted almonds, this dip is unlike anything I've ever tasted (and I'm a little hummus obsessed). The house grilled bread paired perfectly and set us off to a ripe start for the roasted squash with pepita sauce and the whole fish with citrus fennel + cashew salad. A couple of beers later, we were in heaven and headed down the street to Gitano for more magic. Kitchen Table (fine dining, $$$)- Big fan of the Quesadilla de cuitlacoche con flor de calabaza (mushrooms with squash blossoms), and Bori could not stop raving about the Octopus. I love it when food makes people happy. Those moments are the ones you remember forever. Drink special was the Caipiranhas so we had at least a few of those. Kitchen is definitely worth making a reservation. It was nice to head north of Tulum Road for a night and get a different point of view. Matcha Mama (coffee/tea shop, $) - Well, isn't this just adorable? I'll admit, it's more of a photo opp. than anything. But maintaining one of my favorite morning rituals while away from home makes the trip that much sweeter. We had the Mango Tango and an iced matcha, just enough to give a little boost of energy before heading out for more exploration. Fair warning, it can be tough to spot from the main dirt road, but it's located in a small grouping of businesses including a pizzeria near the south end of Tulum beach. The folks behind the counter are just lovely. La Eufemia (tacos/drinks, $) - Come here for the best of all worlds. A casual, chic beach club with umbrella tables if you're into some shade or sunbathing lounge beds where you can chill for the afternoon. The vibe here is very low key with zero sense of urgency and comfortable sassiness on the menu (it literally reads: "today relax and eat some f*in tacos"), accepting of everyone to enjoy the music played on glass bottles by one of the staff. They also have killer tacos (I had one fish, one shrimp) and we finally got our pina coladas! At the risk of sounding cheesy, I'm going to bring up one of my favorite quotes from Maya Angelou: "I've learned that people will forget what you said, people will forget what you did, but people will never forget how you made them feel." During the week we spent here, Tulum was my 'people.' I left feeling alive again, overcome by gratitude and a renewed sense of adventure that often gets lost in the daily grind. I also came home with a stronger friendship that I will cherish forever, so this magical Mexican paradise will always hold a special place in my heart. What are your favorite places to getaway and recharge? And what do you look for when booking a trip? Drop me a comment so I can get to know you a little better. 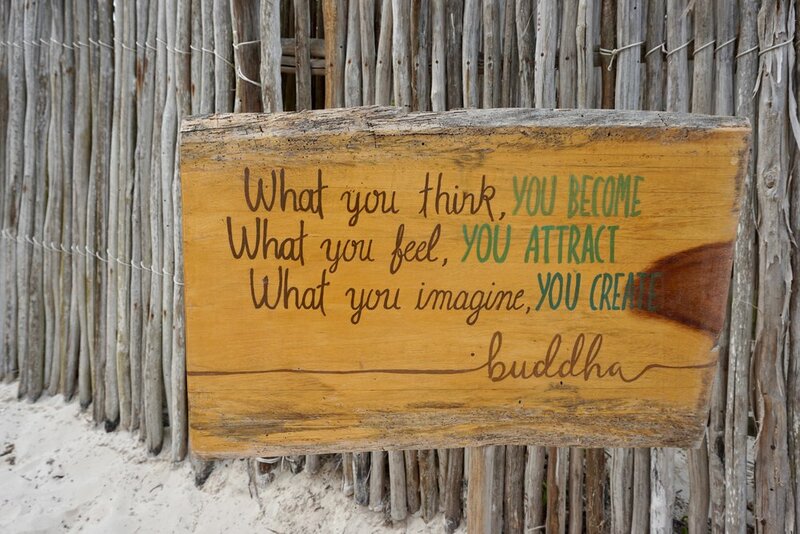 Adorable signs with positive messages are scattered around Tulum, reminding you what's really important. What are friends for if not to indulge in the most extravagant brunches on the Sunset strip? Ok, they're for a lot of things, it just so happens for me Saturday food fests are a high priority. I first spotted The Butcher, the Baker and the Cappuccino Maker on the feeds of a few L.A. lifestyle bloggers and was immediately drawn in by its iconic Colorburst lattes. If you haven't seen one, I can only describe it as the most instagrammable drink I've ever seen IRL, and I've had my fair share of bright and beautiful frosé, and bloody mary's with literal meals as toppings...we'll get into that another time. At $7 a cup, these are definitely a treat but my friend and I both work in social media and can't resist a great photo opp, no matter how 'basic' it is. We're here for it and we're not changing for anyone. The best part is that these beautiful babies taste as delicious as they look. If you're in need of a major caffeine hit, stick with a cold brew for that proper slap in the face but if your at all a latte lover, the Colorburst is certainly worth a try. We opted for almond milk, but you can also go with whole or non-fat. Because you can't drink coffee on an empty stomach, we ordered a round of the Bacon Maple Scones with whipped maple chili butter. Um, excuuuuse me? Butter? HELLO. I'm not even much of a bacon person but give me some carbs with syrup and butter on them and I'm close enough to a waffle to call it the same. Only THIS was better. Scones can sometimes have a reputation for being dense and dry, but these are so rich and flavorful they melt in your mouth. With just enough maple syrup and butter to compliment the perfectly placed bacon bits, this is a dish you want to eat slowwwww. I probably could have stopped at the scones, if we're being honest. But why when there's an entire menu to be indulged?! Sometimes I forget when I'm loving a new place that I can come back anytime. In other words, this isn't my last meal. I don't have to eat EVERYTHING. Then, adrenaline or hunger or fomo kick in - probably a combination of all three - and next thing I know I'm ordering the croissant sandwich. Remember what I said about butter? Literal kryptonite. This bad boy gets a highly recommend from me. Your choice of bacon or salmon sandwiched between a flaky, fluffy crust with a perfectly yolked egg (you know, the right amount of runny where it doesn't soggy the bread but makes everything it touches taste like heaven). Coupled with a savory salad and tiny little pickles, BBCM officially found all my weaknesses and played them like a violin. Cage-free egg, gruyere, avocado, arugula, tomato jam, with smoked salmon. More than a few of my favorite things. We left full and thankful for a good time well spent and it actually wasn't that expensive ($$) considering the location. Although my partner in crime was underwhelmed by the flavorless Breakfast Bowl (not pictured) so be careful with that one. Unfortunately, I didn't capture any photos of the cafe's crisp white aesthetic and awesome outdoor patio - they have some great shots on the website. Buzzing every weekend with the beautiful faces of Hollywood, it's definitely a scene and a reason to break out your Sunday best. Next time, I'd love to check out their dinner menu. Have you tried it? What are your favorite quirky brunch spots in LA? It's hard to keep track of all the new bakeries and cafes popping up, but if you find a latte more beautiful than these I want to hear about it. Welcome to Call Me Kass! I'm on a mission to travel the world, grow spiritually and live compassionately.